A custom-built roller skating venue has opened in Tottenham. Nearly 100 years ago the majestic space in Bruce Grove was a cinema but now Roller Nation is transforming it into a mecca for roller skating lovers everywhere. It will be the premier place in London to slip on roller boots and skate until your heart’s content. 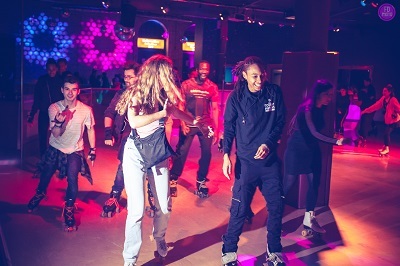 Initially open five days a week this “nightclub on wheels” will give thousands of people each week the chance to experience the roller disco phenomenon that swept the country in the 1980s. “You will be entering a full-on, high production value space that no other skating venue in the world even approaches,” said Tony Askew, Director of Roller Nation. “It’s very exciting for the area.” Different nights will have different themes including: student night on Wednesdays; a ‘soul skate’ on Thursdays; and the ‘golden era of disco’ on Saturdays. Junior sessions will be available at weekends in the daytime alongside the opportunity for wheely good birthday packages! Instructors will be on hand to help beginners. Roller Nation is a London Living Wage employer and has been working closely with Haringey’s Employment and Skills team to offer employment opportunities to residents. through our employment service and through the Opportunity Investment Fund. Hall’s Greengrocers in Holcombe Market, is the oldest running business on the High Road. Family-run for over 100 years from the days of their greatgrandfather, the market stall was passed down to Dave and his brother Andy. Hall’s Greengrocers and Holcombe Market hold a special place in the hearts of Bruce Grove shoppers. joining Hall’s and Thompson’s Seafood. 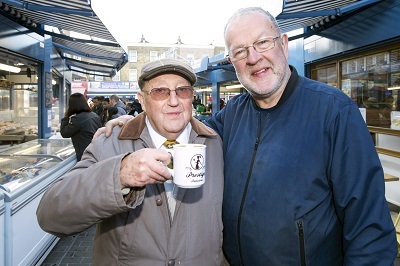 Dave loved to bring the community together, he was an ardent supporter of other local businesses and was very passionate about his football team, Spurs! Tottenham will miss Dave dearly. Spooky spectres and great quakers are just some of the fascinating subjects highlighted in a new venture called Tottenham Heritage Walks. Carol Hebbs, who runs the T on the Green cafe in Bruce Castle Park, was a former council Heritage Champion. As part of her course she learned about hosting guided walks and – combined with a lifelong love of history – has used her knowledge to launch her own tribute to the past. Alongside her friend and medium Sarah Sheppard, Carol has also started a ghost walk which is half history and half mystical. 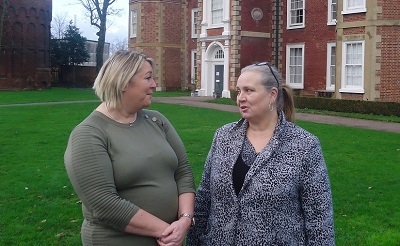 For 2019 Carol plans to host regular heritage and ghost walks and has such a love of the area that she is already planning new ones. A new group aims to make Hartington Park a safer, cleaner and more pleasant place for residents to enjoy. 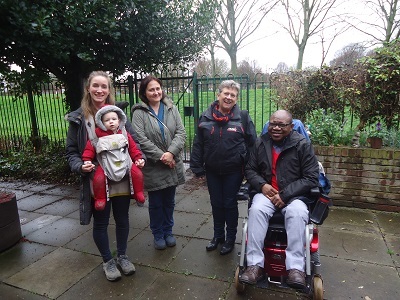 Friends of Hartington Park and Carbuncle Passage plan to make the “unloved” green space just a few minutes walk from the Tottenham High Road, a park to be proud of. department planted 15 mature trees. Carbuncle Passage’ (external link) on Facebook. 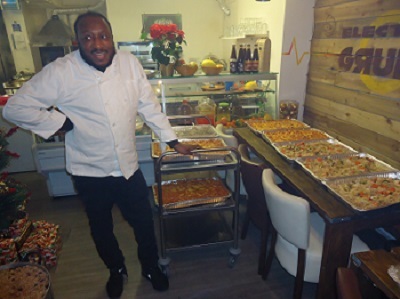 A Tottenham chef and business owner helped vulnerable adults enjoy a Christmas party they will never forget. Steven Pessoa runs Electric Grubb, his healthy café in the High Road. In December he provided enough food for 70 people at HAIL (Haringey Association for Independent Living) for their Christmas party at Tottenham Town Hall. centres or hosts a meal for the adults with learning and physical disabilities at his café. 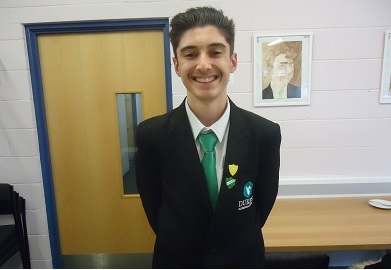 As well as helping vulnerable adults Steve offers half-price discount meals for students and usually throws in a piece of fruit and a drink at no extra charge. 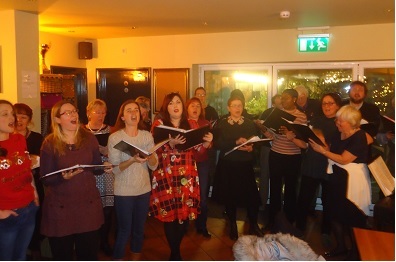 It was far from a silent night as the New Tottenham Singers entertained a packed Antwerp Arms with a feast of carols. The free event took place just before Christmas. The concert finished off a busy few weeks for the choir which staged two major events in November and December – a Concert of Remembrance attended by more than 500 people for the Armistice centenary, followed by their traditional Christmas concert with a 16-piece band staged at their home in the Bernie Grant Arts Centre. Open to all, the choir is non-audition to include experienced choral singers alongside complete novices. The choir is always keen to hear from new members – who will, without doubt, be invited down The Beehive pub following their first rehearsal! The New Tottenham Singers rehearse every Tuesday during term time at the Bernie Grant Arts Centre, Town Hall, Approach Road between 7.30pm and 9.30pm. For more details email info@tottenhamsingers.com or visit www.tottenhamsingers.com (external link). educational standards. Schools are struggling and now they can’t afford certain equipment and have to become academies to get more money. I would also increase social housing. Sadiq Khan said that if he was elected as Mayor of London he would build 80,000 new homes a year but he broke that promise. There is a big problem with homelessness and we need more homes! To buy a house in Tottenham and London is just too expensive and even renting can cost you hundreds of pounds a month so we’re in dire need of more social housing. see any police on the streets these days. Residents in Northumberland Park are benefitting from a major reduction in crime following a successful operation to curb the amount of violence and anti-social behaviour taking place in the area. 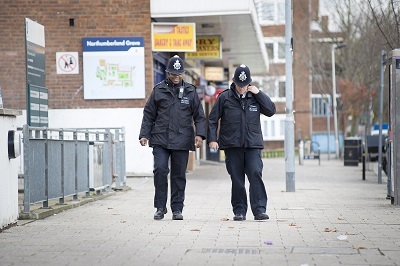 Haringey Council and the Metropolitan Police joined forces to launch ‘Operation Marlin’ which aims to reduce the crime most affecting Northumberland Park and help target those who are actively involved in criminality. behaviour and provide a safe and secure environment for people to live and work. The response was immediate as there was enhanced CCTV usage on different estates and the targeting of known offenders and key individuals was established. There has also been a 15% reduction in robbery, 13% in knife crime and 11% in violence that results in injury.